Good morning! I don’t know about you but it’s most definitely a snow day here in Maine. Yup, it’s the second day of spring and the ground is blanketed with a thick layer of fluffy snow. I work from home and most days I can be found sat at the computer in my PJs. The best part about snow days? It’s totally acceptable to stay in your PJs and eat a late breakfast to fuel the shoveling. I’m a bad New Englander and we’re all out of bread (although we do have milk) but luckily I always have a couple of packages of these Stonefire naan breads in the freezer for emergency breakfast pizza situations. 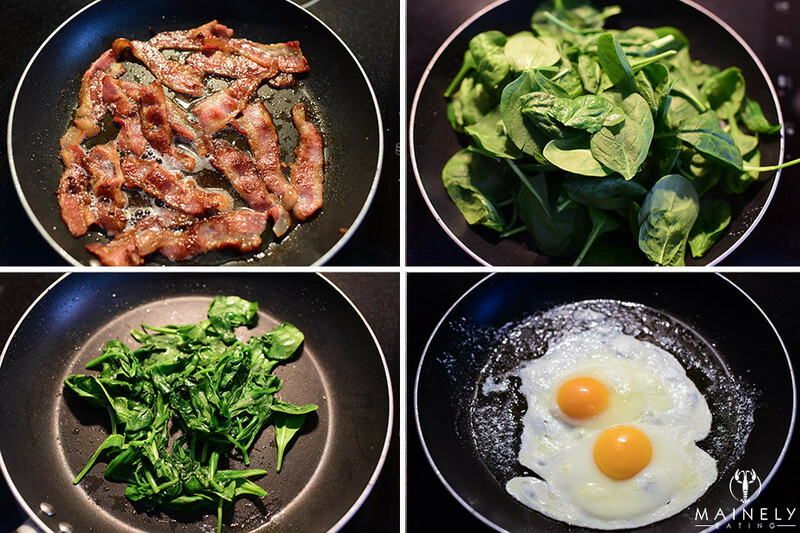 Bacon, egg and cheese seem like prerequisites for breakfast and then I added spinach because adding spinach makes everything healthy and low-calorie right? 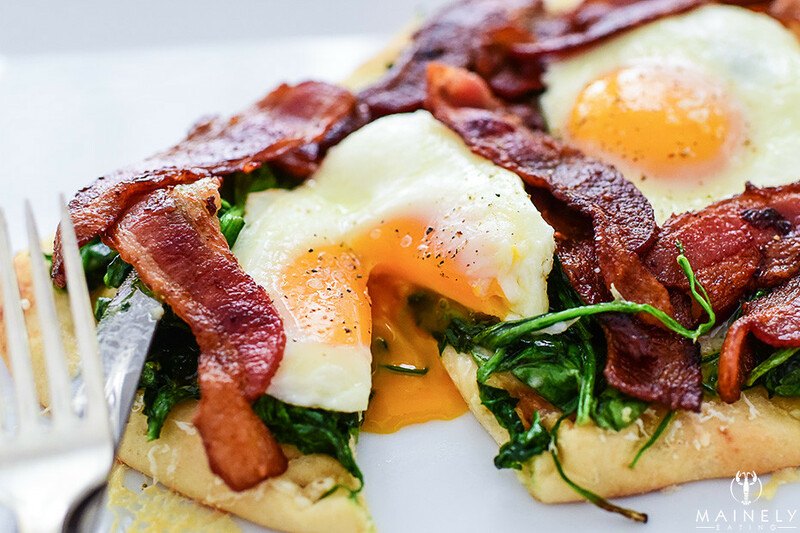 This is a super easy and tasty breakfast, perfect for two people. 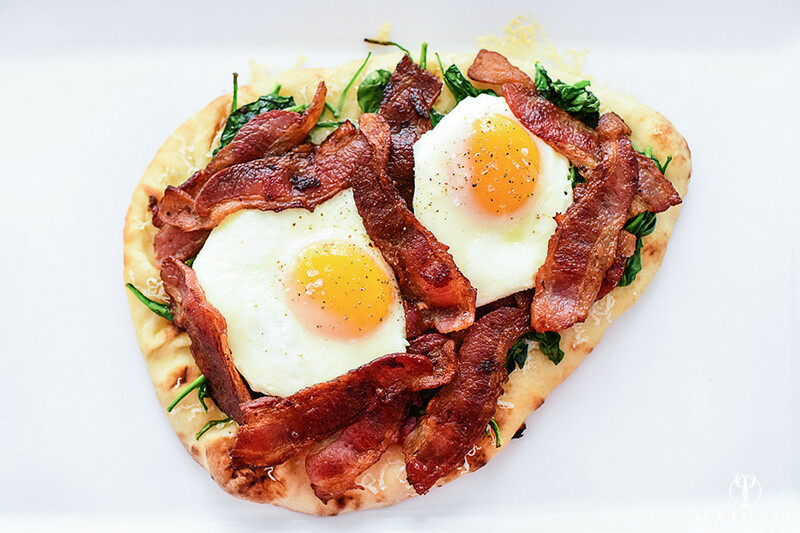 You simply cook up bacon, wilt spinach, fry eggs, and layer it all on your flatbread which is made toasty warm in the oven with a generous layer of melty-cheese. 1. Grate cheese. Preheat oven to 400 degrees. 2. Saute bacon over a low-medium heat in a non-stick frying pan, turning regularly until golden brown and crispy. Remove bacon and set aside to drain on a paper-towel lined plate. Carefully wipe out pan to remove the majority of the hot bacon fat. 3. Add 1/2 tbsp of butter to frying pan and cook baby spinach until wilted. Drain any excess liquid and set aside. Wipe out pan (do this well unless you want green eggs). 5. 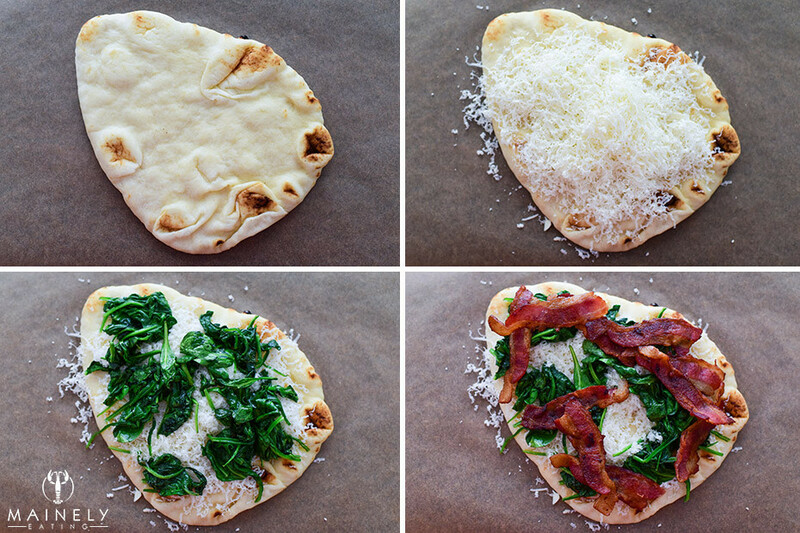 While eggs cook, scatter grated cheese over flatbread, add spinach and bacon and pop in oven (on baking tray/cookie sheet) for 5 minutes. You can leave two little hollows for your eggs if you like. 6. Take flatbread out of oven and add eggs. Enjoy! This entry was posted in Breakfast and tagged breakfast pizza, stonefire naan breakfast pizza by Mainely Eating. Bookmark the permalink.